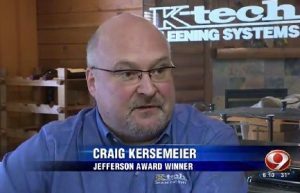 March 8, 2016 – DKI, North America’s largest disaster restoration contracting organization, today announced that one of its member companies in Weston, Wis., K-tech Kleening Systems Owner Craig Kersemeier has been recognized with a Jefferson Award for his numerous charity efforts. The Jefferson Award is a prestigious national recognition which honors community and public volunteerism in America. K-tech Charities, launched in 2006, has raised over $750,000 for families in need, breast cancer patients and various scholarships. From its holiday food baskets to its annual Pink Ribbon Open charity golf tournament, K-tech enjoys giving back. Kersemeier considers himself an organizer, asking business leaders, friends, company employees, and others within the community to volunteer their time or money for these causes. “Don’t ever sell yourself short and say you’re just one person; you can’t make a difference. You’re wrong. If you have a group of people together, you’re pretty powerful,” said Kersemeier. To learn more about the Jefferson Awards Foundation or to nominate someone you believe to be deserving of this honor, please visit www.jeffersonawards.org.